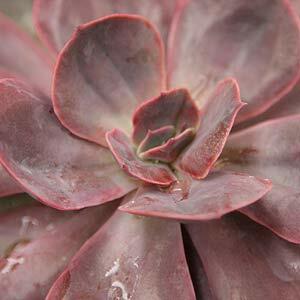 Echeveria are succulents, they are a large genus and with many attractive varieties they make great specimen plants. They can be grown in containers or pots as well as in the garden, depending on the climate. Being easy care and with a naturally attractive growth habit they are popular amongst collectors and gardeners alike. Native to semi – arid areas of Central America, they are also drought tolerant. A rosette forming plant, they come with a number of types of foliage in colours from greens through to blues and red. Their natural environment is amongst rocky outcrops, and although they do come from dry areas, they are mostly found at elevations that mean the temperature is moderated. 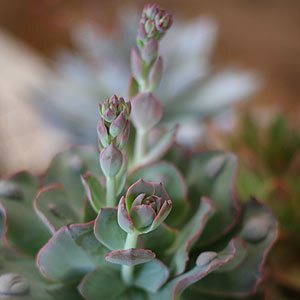 Echeveria are easy to grow given the right conditions. Most Australian nurseries specialise in sales of the newer, and very popular hybrids as well as some of the more common species. All species plants prefer full sun to part shade and a well drained soil, try a gritty open mix. Most species do not tolerate frost or damp conditions, so a pot on a sunny porch or verandah can be an ideal position. Use a specialist succulent potting mix and top pots off with small stones for a great clean look. Best grown in a container or in a sunny position in a well drained soil. A position in full sun will be best. Although these are a drought tolerant plant, in containers some watering will be required. Water once the growing medium has dried a little and in winter cut back on water. Good drainage is essential as these a plant that is subject to root rot in wet soils. Soil, use a specialist cactus and succulent potting mix for best results. Some perlite added to normal potting mix or soil will help improve drainage if required. Potted specimens should be repotted every 3 years to retain vigour. Fertiliser can be used, we suggest a diluted liquid fertiliser (30% strength) twice a year. When growing in containers try not to over-pot, however it is the growing medium that is more important. In general require sun to part shade they require very little maintenance. Only water during plants the growing season. All require a frost free position, over winter indoors in cooler climates. Many Species are suitable for growing in containers or pots, especially the smaller species. All will flower with what we regard as attractive flowers. Echeveria ‘Raindrops’ (pictured right) is just coming into flower. Echeveria grow well in full sun, however not really hot afternoon sun. They all require a well drained soil, and most varieties grow best in these conditions. You may find that newly purchased plants take a little time to acclimatise, however they do so fairly quickly. You will also find that some varieties change foliage colour in summer, some dramatically, and this is normal. Generally a problem free plant a few problems include. Mealybugs can be a major problem, not likely if they in the sun. Aphids, especially on the flowers. Simply wash them off. 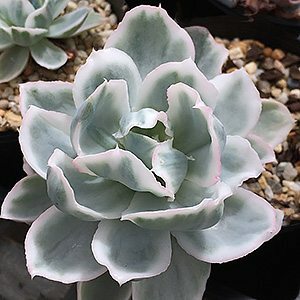 Frost and cold can kill Echeveria. Elongated foliage can be caused by to much shade. Echeveria will get some dead leaves at the lower part of the plant, this is natural and once they have dried, you should remove them. Removing the dead leaves prevents pests such as mealybugs from finding a home. Wait until the leaves are dry and come away from the plant easily, this will ensure minimum damage to the plant. They should pull away easily. Dispose of the leaves, do not leave them in the pot. If the leaves are soft and yellow, its a different problem, usually caused by overwatering. Many named cultivars are available, having being hybridised for many years names can be a little confused. E. elegans – Easy care rosette forming species that will quickly produce offsets. E. derenbergensis – Neat compact growing species, attractive flowers. E. imbricata – Larger growing, blue foliage often margined with red. E. cv. ‘Perl Von Neurenberg’ – Attractive spoon shaped pink foliage, very frost tender, and very attractive. E. minima – Very tight rosette forming with small orange flowers in spring. 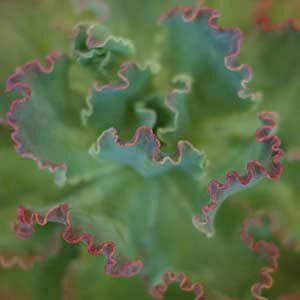 Specialist succulent grower with a large range of Echeveria and other succulent genera, including rare and unusual varieties for the collector.